Have you guys ever created a fantasy wish-list? Well I did! I do it all the time and my list is filled with items from Dolce and Gabbana to Alexander McQueen. I actually came across Matches Fashion that stock alot of designer brands such as Dolce and Gabbana, Chloe, Lanvin and Mary Katrantzou etc and I can spend hours on there. Its the ultimate shopping place, but if only I could actually proceed to checkout! I love that the collections are always updated to the current trends. I know it is very expensive but if you are looking to find some great pieces and willing to invest in them, this is your place. 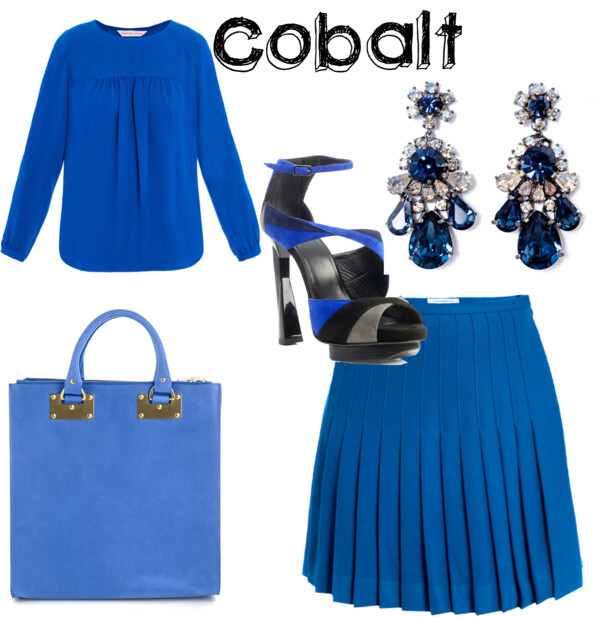 I am completely obsessed with Cobalt at the moment. I love everything cobalt. And cobalt is a very definitive colour this season. I found these Shourork earrings and I am now obsessing over these. How gorgeous are they! The skirt is a J W Anderson design, something very different in a way and so are the heels. I've never seen heels like that. Love the Sophie Hulme shopper bag too! This colour is just amazing for that 'pop of colour' in a look. The blouse and the skirt can with paired with alot different items. I personally think lace can never go out of fashion. It's so elegant and can be contemporary and will suit everyone because there are so many different types and colours of lace. I picked some different colours out here such as gold, red and pink. The red lace dress is my favorite! It deffo adds alot to your look and personality. Another one of my favorites is the Alexander McQueen lace dress (the burgundy one). Love the way it's cut and made. I think we need to find other colours of lace rather than the normal black and white even though they are classics! Cobalt and lace are my favorite trends! Have you shopped from matches fashion? Your blog is stunning. I love it! Just followed you. I love cobalt to at the minute. I think it's such a beautiful colour. Cobalt is definitely one of my favourite colours! I find lace really hard to dress. It looks tacky on me, maybe because of my curls. But I love to a beautiful white lace dress!